Making vintage and Eastern vibes my business card. First of all, want to greet you all in this post-Līgo Friday. Hope you all had some really good, 5 days long, quality time, but it's time to go back to business. Nothing feels better than the ability to move onwards, to start pushing things forward with double force after a productive, maybe not that much summer-y, long term weekend. So today, on such a good, pleasant day, there's something special I would love to share with you. In a sense it has something to do with my ongoing process of style searches, or better say an extension of personal style boundaries. If you're following me on Instagram (if no, then you're more than welcome to join me now - @practicalqueenap), then you might have noticed heavy expansion into the treasures of the Eastern and Southern countries. Not everything has yet been shown, so it's even more interesting what I'll be able to come up with in the following months. One thing is crucial for me when implementing Eastern and Southern motives - it should be matched with habitual to Western world pieces, like basic pair of jeans or white shirt, or an elegant evening dress paired with white blazer and so on. Thus, I really want to show that the treasures of such civilizations are pretty practical in our urban life. Today's outfit has quite a special meaning to me. 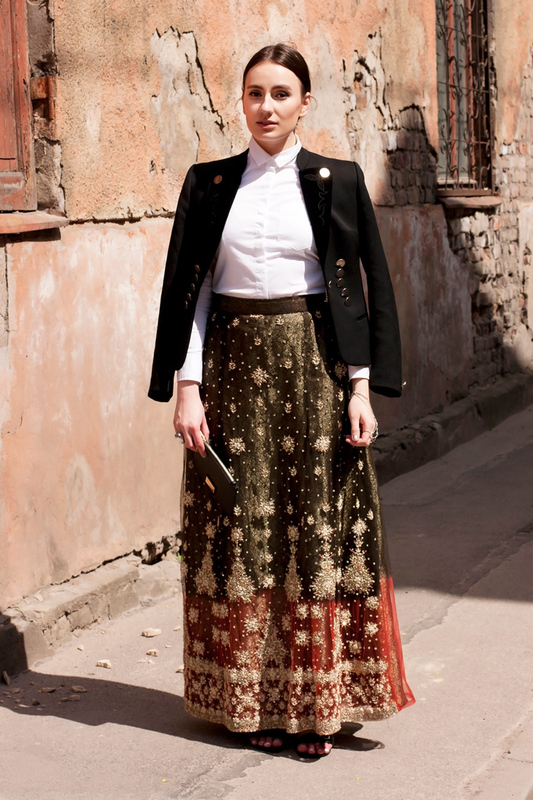 Just because it's a combination of my two favorite aspects of modern fashion - vintage and Orientalism. No need to dissert more on the topic of Eastern vibes. This beautiful hand embroidered skirt in Indian style happened to be one of those great finds of mine. And it happened to be all mine, simply because it took both of us some time to figure out we are meant to be together (well, the skirt knew that straight from the beginning). Otherwise, how can you explain the fact no one else took it prior to me? Next. The vintage blazer. The vintage blazer in military style. Honestly, couldn't imagine till the very last moment two might form an uberly cool couple together. But they did. And proved East can easily make friends with vintage, and be pretty modern for urban West.